#3345 - Original Sam Raimi Autographed Directors Chair from the Amazing "SpiderMan" Movie! A major piece of Hollywood History! Largest opening of any movie to date (this was written prior to the opening of the new Star Wars movie... so we'll see if it holds up!). Purchased directly from Sony Pictures with Certificate of Authenticity from Columbia Pictures as well as a registered certificate from Online Authentics. 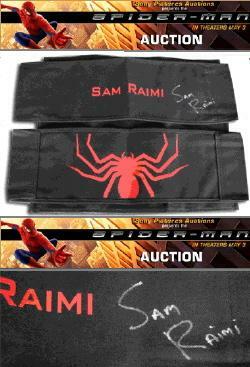 Back black canvas cover features the large Spider logo on one side and the name Sam Raimi printed on the other side along with Sam Raimi's signature. This Director chair back (and seat) is the same as those used on the set of the Columbia Pictures film Spider-Man. Item fits a standard Director's Chair (Director Chair NOT included).